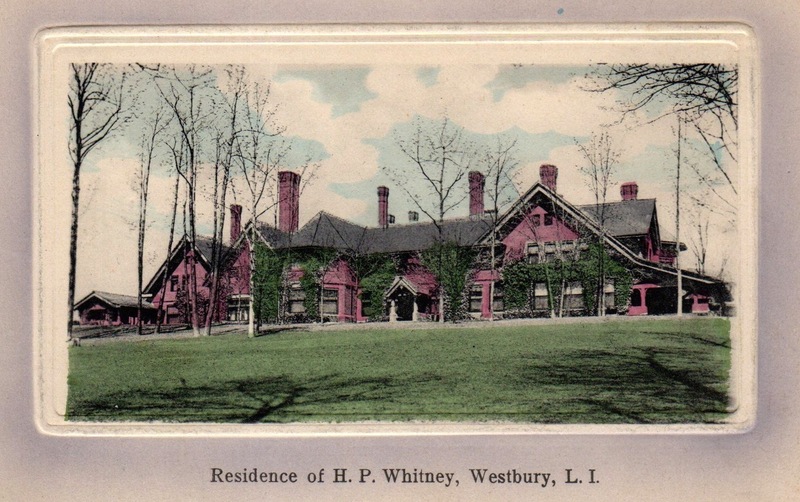 'The Manse', the William Collins Whitney estate designed by McKim, Mead & White between 1898-1902 in Old Westbury. 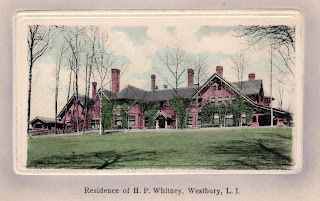 Following Whitney's death in 1904 the estate was inherited by his son Harry Payne Whitney. Click HERE and HERE for more on 'The Manse' which was demolished by Harry's son Cornelius and replaced with a Delano & Aldrich design that is now the clubhouse for the Old Westbury Country Club. McKim Mead & White or not, I've always found this a hard house to love. Actually, Delano & Aldrich or not, I've never much cared for Sonny's house either. Ditto; best I could say is it is a ponderous structure. Still, I would have loved to have seen it in its heyday. I too would have loved to have seen this one live. I've always been partial to it...a jumbo sized Long Island hunting lodge. Between steeplechase races on the lawn and all the fox hunts it must have been something (especially since the stable used to be almost twice as long). Do you think the roofer retired after this one? Are there any photographs of the interior? Or did the roofer have a nervous breakdown? wonderful aerial. There's always that moment that everything was perfect, and this captures it. Apparently, there won't always be an England after all. "Day of the Locusts, Part Two." notably less fussy than their fronts. They are often placed closely together to maximize the developer's profits and appeal to people who value perceived social status over actual, physical, economic or historic value. "...he now specializes in properties that sell for between $3 million and $10 million. “Mostly, though, $3 million to $6,” he said. “I love that market — there are probably 10 times as many people in that market than to buy an eight- or nine-million-dollar house, right?”"
They're bigger, better, and of a higher quality than a typical "McMansion", but in the über-exclusive back-roads of the Hamptons, just as despised. Off topic but does anyone else on occasion get a redirect to GoDaddy when trying to reach oldlongisland? I seem to have that problem more and more. I've check the address and when I do get in its the same as the one redirected. Odd stuff. Regarding "A large and pretentious house, typically of shoddy construction" that resonates loudly with a lot of the new in-city "mansions" built here in Chicago. I think most people would be gobsmacked to see just how absolutely cheap (and shoddy) the bones are of new construction $5M+ homes. Cinderblock core structure with that gilded edge of grandeur on the visible exterior. 'High end' construction firms of today ply their trade with skill sets woefully deficient from yesteryear and deploy cheap materials. A wonderful vernacular unpretentious though large country home, beautifully sited. MMW at their best.